You will have to bear with me because I am going to go step by step in all this search for Anton Cayo’s ancestors even if it takes the whole year. I will focus only on the Cayos unless someone related to Aldéi Lord’s ashtray contacts me. September 19th, 1850, Colchester, Vermont. There is a family on this census page. 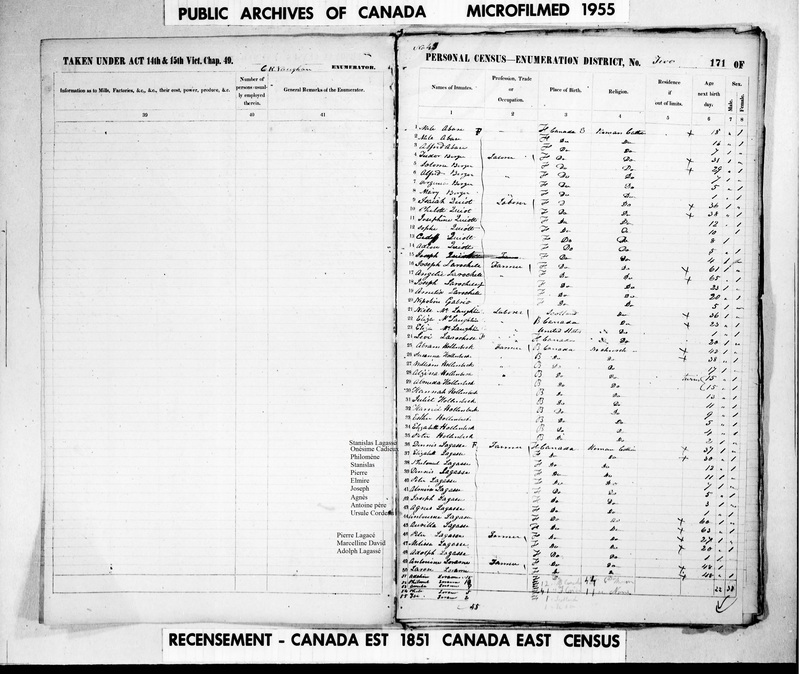 All the family members were born in Canada according to this census. Censuses are not always a reliable source, but in this case, I will use them and proceed cautiously. The wife of Peter Kayou is Frances. She’s 45 years and thus would have been born around 1805. She is probably Françoise Trudeau. I can’t think of any alternative for her given name except Françoise. Peter is of course Pierre. The name Kayou is most probably Cadieux. People back then would prononced it Caieux or Cayeux, dropping the “D”. Who are the chidren in this family? Two sons: Antoine and Samuel. 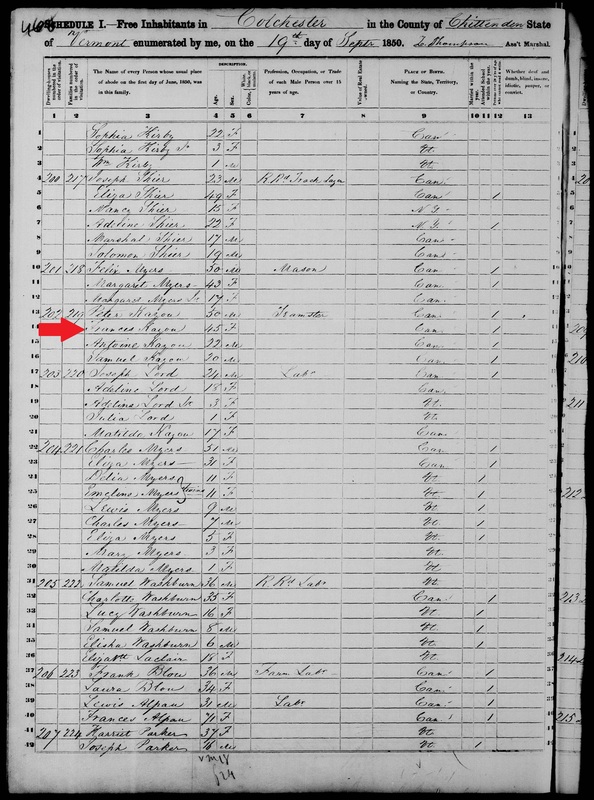 My guess is that Antoine, 22 years old in the 1850 census (1850 – 22 = 1828), is Joseph born in 1826. Samuel, 20 years old in 1850 (1850- 20 = 1830), is Charles Anselme born in 1830. There was also a Cordelia in this family. She was born in 1834. Where would Cordelia Cadieux be? Well, she would be just next door with the neighbors baby-sitting little Julia Lord of course! Mathilda, 17 years old (1850 – 17 = 1833). That’s all close enough for me! Peter Junior born in 1824! Peter would be Mary Evelyne Cayo’s grandfather. Every time I want to ease up a bit on writing on this blog there is always something popping-up like this ashtray which rekindled my interest in our ancestors. Lésime was my great-great-grandmother’s first name, but that’s not what she was named all her life. She was once named Elizabeth in the 1852 Canadian census! This shows you how difficult it is to find who your ancestors were when you are looking for them in the 21st century. Lésime was Onésime Cadieux born in 1822. Onésime can also be a man’s name. That’s what I told my wife yesterday. Lésime married Stanislas Minier dit Lagassé in 1840. Stanislas would later become Dennis Lagasse when he emigrated to the U.S.
Dennis Lagasse would become later on Dennis Lagasse I. He had a son who he named Stanislas who became Dennis II. In turn Dennis II also had a son he named Dennis. Dennis III had a son Levi Napoleon who had a son Lionel who had a son he chose to name Dennis. 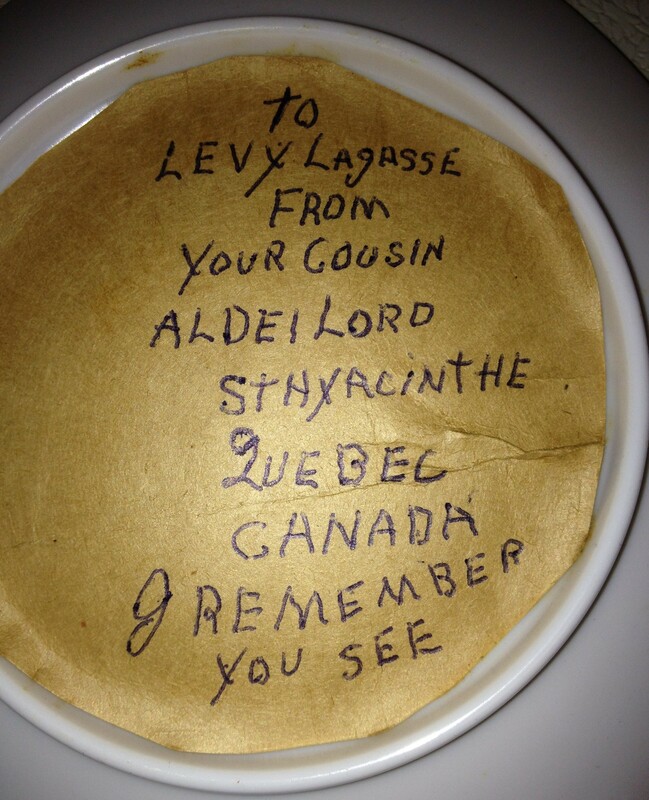 This last Dennis Lagasse is Dennis Lagasse IV who sent me this picture of an ashtray given as a gift by Aldéi Lord to his grandfather Levi Napoleon. That story of an ashtray will be written later after I have written the story about the Cayos which is going to be very long indeed. I feel like Nostradamus this morning. An urge to write again. I’m the son of Lionel Lagasse and the grandson of Levi N. Lagasse and Marie Louise (Dube) Lagasse. Levi was one of twelve children born to my great-grandfather Dennis, and the Lagasse name was spelled with a “y” at the end for a time. 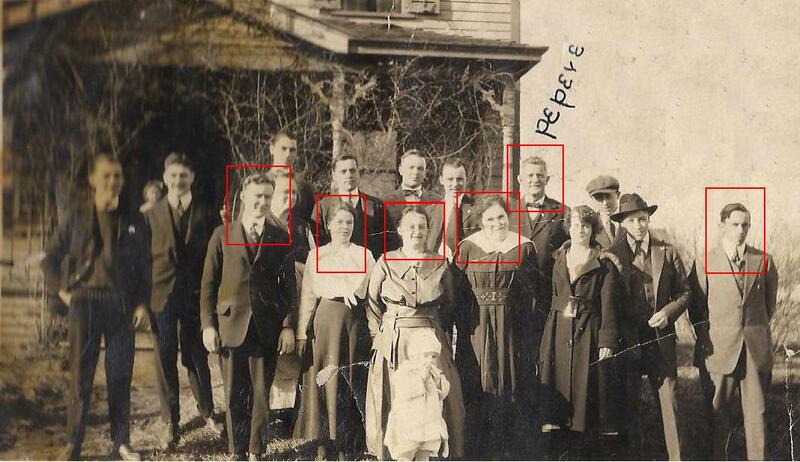 My great-grandfather Dennis was killed in 1921 in an industrial accident while working in Bristol CT. U.S.A.
Are there any others with a great-grandfather Dennis in their family tree? Dennis (Stanislas) Lagasse married Harriet (Henriette) Alexandre in 1862. They had 13 chridren (typo!). My grandfather Léo Senior is their son. He was the last child. He was born June 6, 1888. I know all there is to know, well almost all, and I will share all with their descendants. Contact me… you will not regret it. 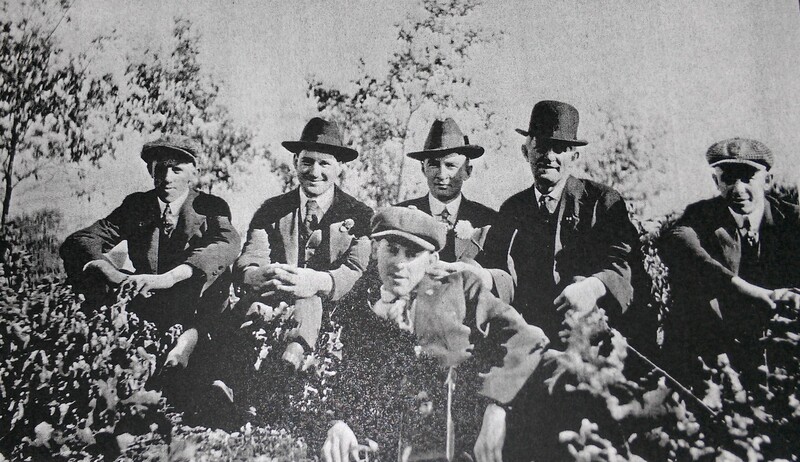 This might be the most important post on this blog about our ancestors. Maybe someone out there on cyberspace is looking for his or her ancestors like Dennis Lagasse was in 2011. I had seen Dennis Lagasse’s message on a genealogy forum that Dennis had left in 2008 if I don’t have these senior moments once again. Luckily I had kept his message in my files so I can share it again with you. This morning I just got the urge to write again on my blog as I was taking my shower. I always get my ideas for this blog while taking my shower or while I am doing the dishes. So what is this all about a candy maker whose name was Cayo? 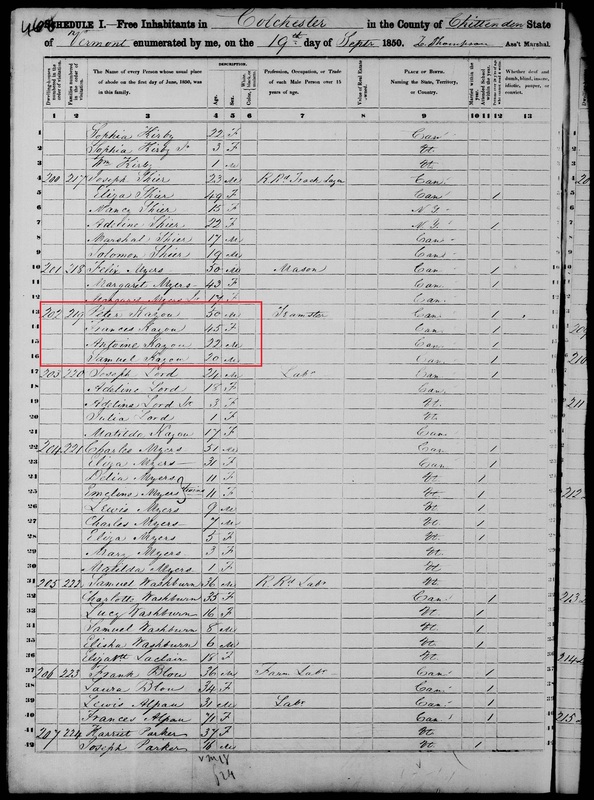 Mary Evelyne Cayo was born in June 1880 according to the 1900 U.S. Census in Burlington. The census says she was a candy maker and her father was a mason. 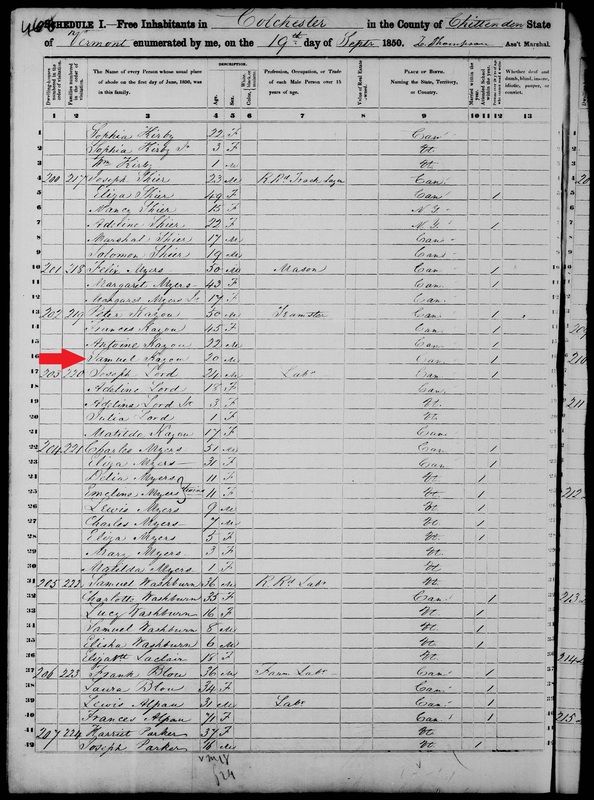 I got curious because I am not sure Peter Cayo is a descendant of Pierre Cadieux and Françoise Trudeau who got married in February 1822. Their first child was Onésime, a little girl born just three months after their marriage. Children born out of wedlocks in those days were often abandonned. The urge has just left me momentarily. How I met my great-grandfather’s sister? That would be a great sequel to How I met my great-grandfather? That’s the title of the post I wrote back in 2010 when Joe and I got to know each other well. Joe is a third cousin also addicted to genealogy. 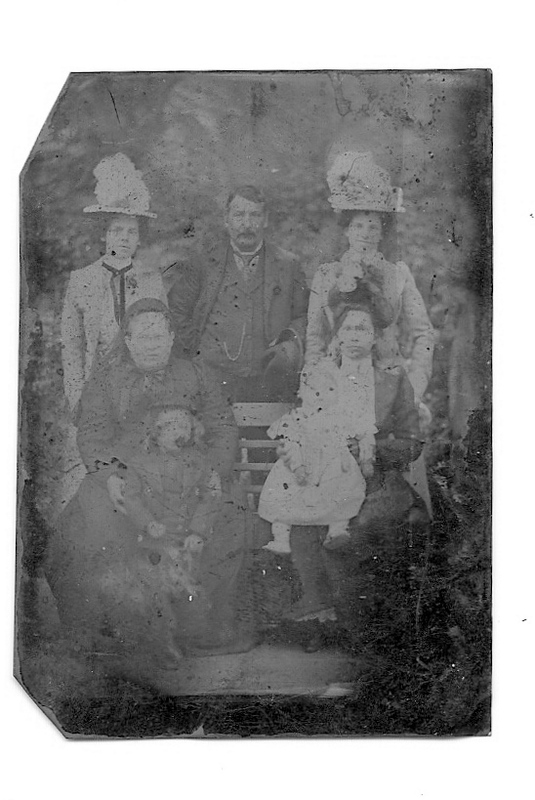 Joe did not have that old tintype picture you see on top. Someone else had it and scanned it. People who stumble on this blog are probably wondering why someone would write about his ancestors or other people’s ancestors on a blog. I know I should be talking about my great-grandfather Stanislas Lagasse this morning… but Joe gave me a lot of information on Stanislas’ sister Philomène. Mrs. Libbie Alexander widow of the late John Alexander died at the home of her son David Alexander 149 Park St. last evening as a result of complications due to old age. She had been an invalid for several years. Mrs. Alexander was born in Quebec, Canada 79 years ago. She spent her early years there. She was married in 1869 to John Alexander. They moved to the state and lived for some time in North Adams, Mass. They came to Bristol twenty six years ago and made their home here. Mr. Alexander died in 1914. 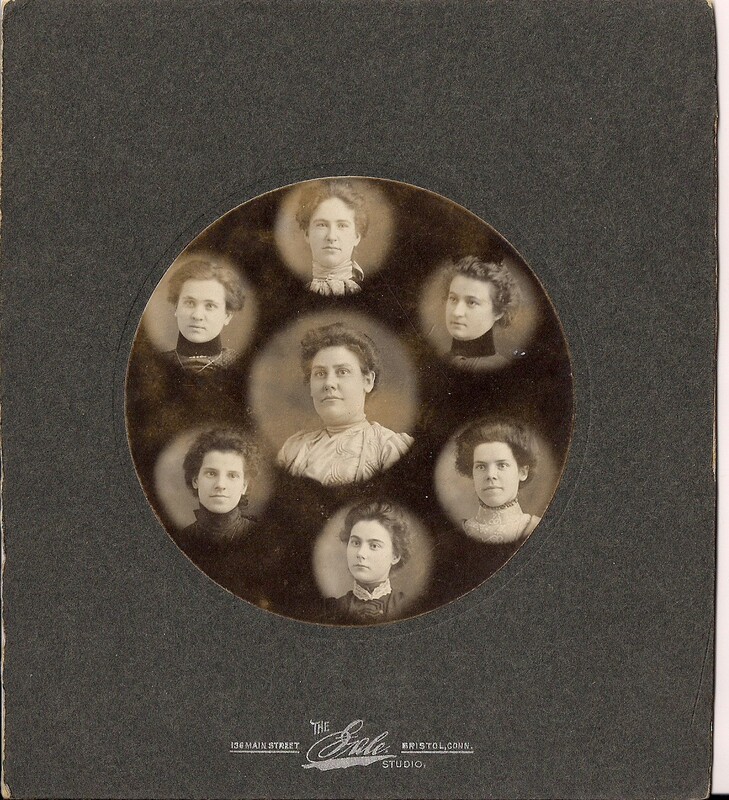 Mrs. Alexander is survived by four daughters: Mrs. David Bleau, Mrs. William Archambeault and Miss Mary Alexander of Bristol and Mrs. Phoebe Lustrich of Brooklyn, NY. By three sons: John, David, and Peter Alexander all of Bristol, and by many grand children and great grand children. She was one of the well known French residents and was a member of St. Ann’s Church. The funeral will be held at St. Ann’s Church at 9 o’clock Monday morning. Rev. Joseph P. Perreault will conduct the services. Now I have her picture and the picture of her daughters. Little did I know back in 2010 that someone living on the West Coast had more than 100 old pictures from her husband’s family with some pictures of Libbie and some of her daughters’ descendants. I could go on and on and on with all these sequels, but I think you get the picture. If you don’t, well you just have to read this blog from the start. 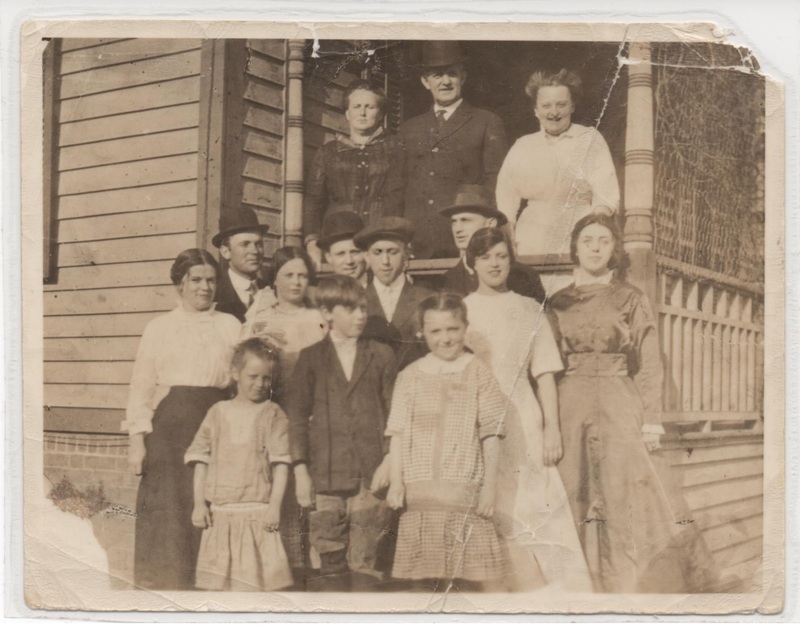 How I met my great-grandfather? View this blog as a sitcom. This is what Dennis sent me with a lot of old pictures in 2012. It was in the old family album. Dennis sent me the whole old family album! I could have asked Dennis to write about all of those pictures he sent me, but Dennis is a hard-working family man with a lovely wife and two lovely children. That’s all you need to know about Dennis, and that I will share about his personal life. I don’t need to tell you how nice a man Dennis is. You just have to look at his great-great-grandfather with two of his grandchildren in a picture Dennis sent me, and read between the lines. This picture is one of the first pictures he sent.In fact it was a photocopy I think. Boy did I get all excited. 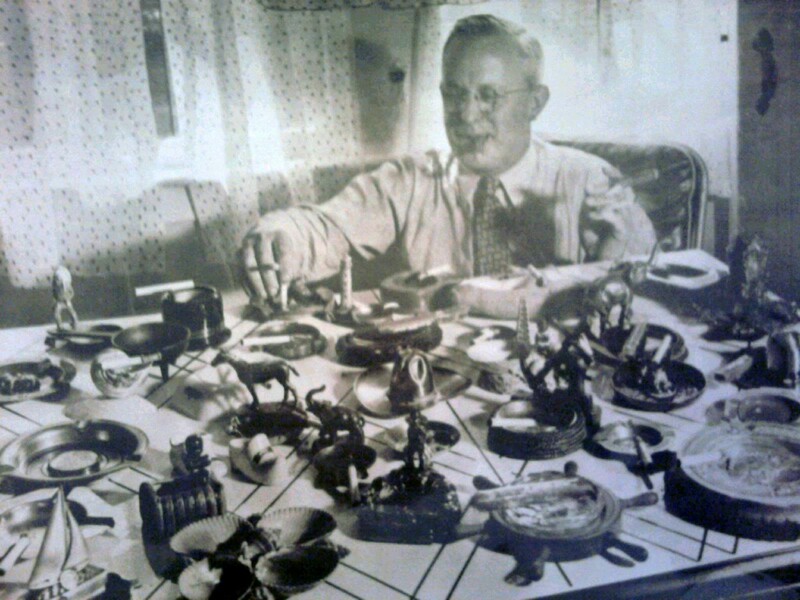 I wrote a lot about that picture and how my great-grandfather was a family man. Family is all that is important in life, and that’s the message I am trying to convey on this blog. Once you realize this, your life will forever change. How you met your great-grandfather? I like to take a trip down memory lane sometimes on this blog, and reflect upon what I have been writing since 2009. This post was written on October 16, 2011. That’s when Dennis wrote me again and I got excited all over again. Sometimes I think I scare people away with my passion for genealogy. I hope I won’t scare Dennis away. 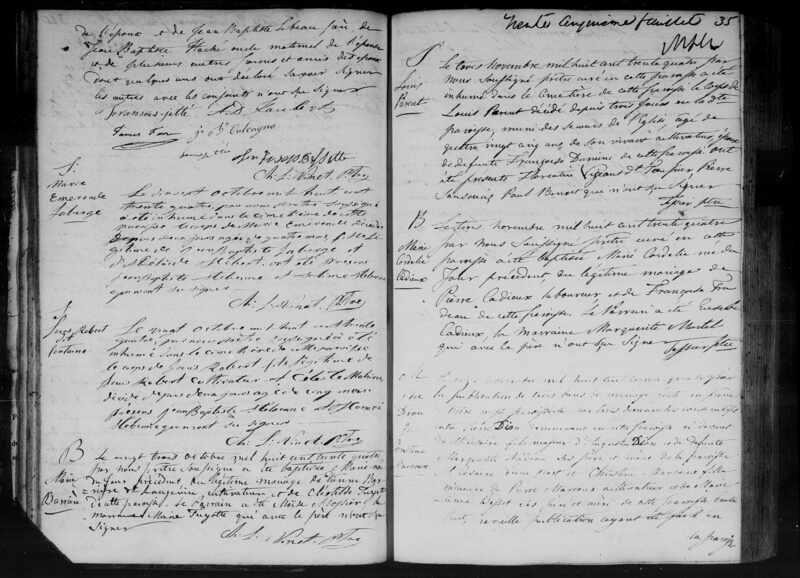 Dennis is a direct descendant of Dennis 1816, Dennis 1842 and Dennis 1864… He lives in Connecticut where these Dennises are buried. I don’t think I scared him away because he sent me this e-mail… when I first replied to his comment. 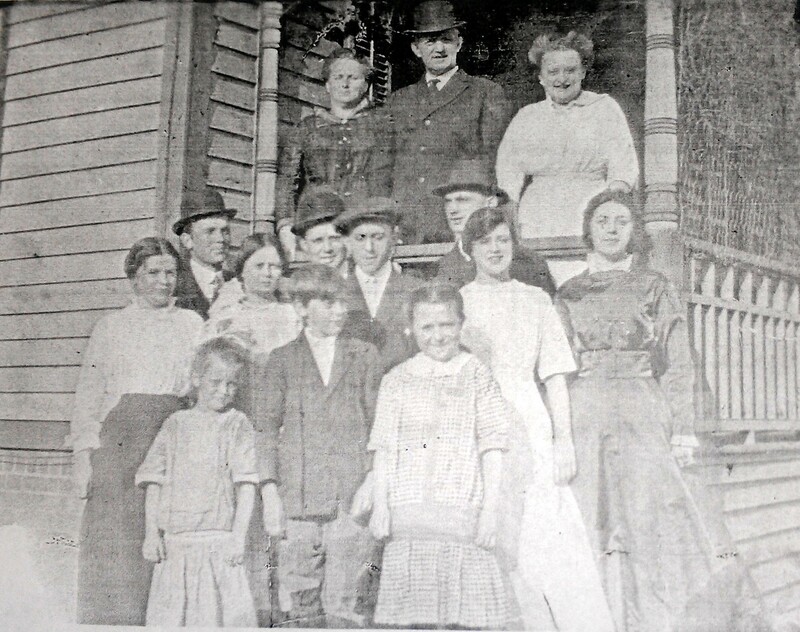 I just talked to my dad… and he’s sending me a copy of the pictures he has of his grandfather Dennis Lagasse with his 12 kids and wife Amanda on their front porch in Bristol CT. He also read to me the Bristol Press newspaper article where it describes the accident that killed Dennis in 1922, he is copying and sending me that also. It’s so exciting for me to see all this history coming together, I live in… CT and am only an hour away from Bristol and would love to help you in any way I can. Thank you so much for all the wonderful work you’ve done so far. 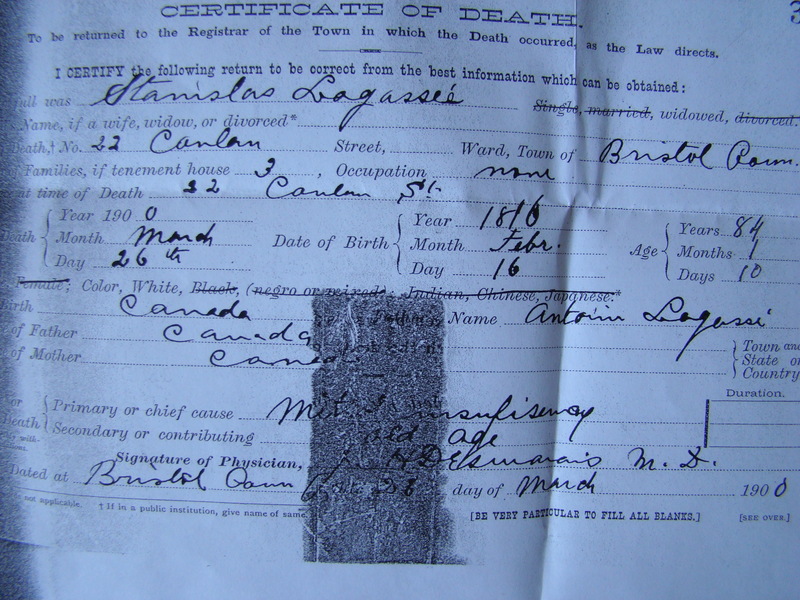 His great-grandfather was Dennis Lagasse who died in 1922. He was married to Amanda Ménard and they had 12 children. Dennis knows that part also. Dennis’ great-great-grandfather was also named Dennis. I don’t know if Dennis knew this. 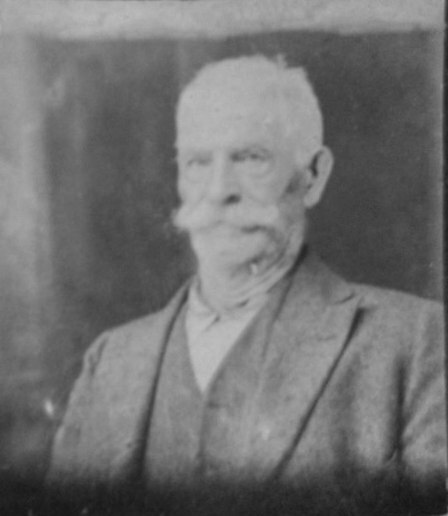 This Dennis Lagasse whose real name was Stanislas Lagacé was born 9 August 1842 in Henryville, in Quebec. He died on June 5th 1927. He worked all of his life. 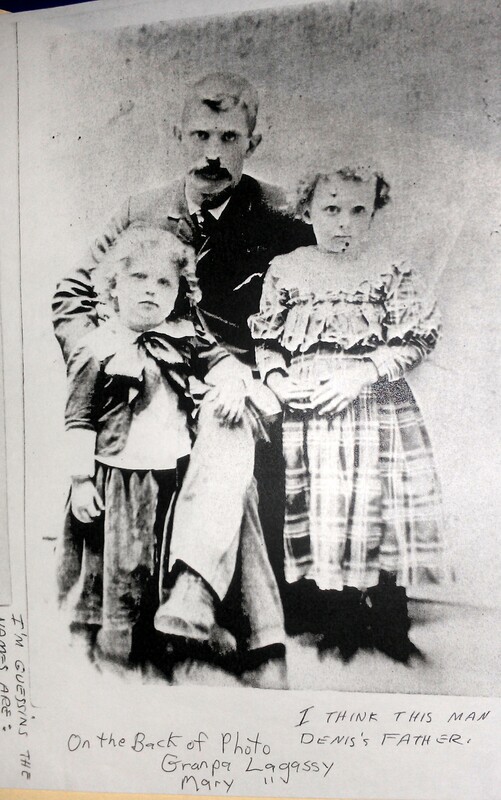 His father, who was also named Stanislas (Dennis), died in 1900. This is his death certificate that Sandy found for me. He was born in 1816. He lived at 22 Conlon Street in Bristol, Connecticut. He was a soldier who came with the Carignan-Salières regiment. Why am I retelling all this? Just to say I don’t write this blog after all, people who write me do, and anything they share is important, even pictures of ashtrays. Now if someone related to Aldéi could contact me and tell me he or she has old pictures like Dennis had, I will start to get all excited again. That’s what Dennis could have said. I am glad he did not. I could have never found all these distant relatives by myself. I found many descendants of all these people who in turn shared their old pictures. Getting back to ashtrays. This one is interesting. Dennis thought it was from Adelaide in St-Hyacinthe. Well Dennis was wrong. 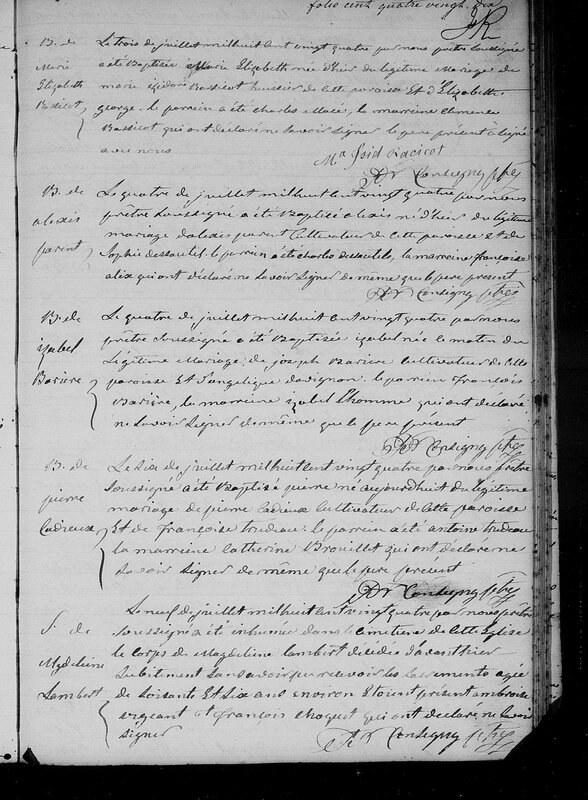 It’s from cousin Aldéi Lord, the son of Philippe Lord and Marguerite Lagacé who was Dennis III’s sister. That’s the first time I have something from that branch. I will tell you more next time. This is how I met Dennis. That was back in 2011 I believe. I had never been that excited in my life, genealogy wise I mean. Then Dennis shared a few pictures of his father which I never posted on this blog. I don’t post pictures of living people, and I hope Lionel will live a long long time. People whose name is Lagasse, or Lagassey, or Lagacé, or La Gase live a long long time. Dennis Lagasse I died in 1900 at the age of 84 years-old and his son Dennis Lagasse II died in 1927 at the same age. Dennis III died in an industrial accident in 1922. Dennis IV thought it was in 1921. That does not matter, the fact is that he died. His lost was terrible I am sure to his family. Since 2011 Dennis has shared more than 100 pictures. He had two more this week. You see his grandfather collected ashtrays. I never posted this picture before. I think the time is right. Levi died in September 1964. I don’t think Dennis IV got to know his grandfather well. He never told me, but I am so excited Dennis took the time to write in 2011. I just got notified that Seeburn is now following my blog. You owe a lot to Seeburn. I will edit this post I wrote a long time ago using ( parentheses) along the way. This was the first article written on this blog. This is the 227th (651st). Sometimes comments get lost on this blog because people don’t read them. This is the comment I received yesterday from someone in Louisiana I believe.